Following on from a survey that we carried out recently, we discovered that the main thing people with Aspergers struggled with was their emotions. In particular, anxiety, depression and stress seemed to be the most prevalent aspects that were affecting quality of life. Dealing with one’s emotions is unfortunately not something that is taught in school. Because of this we decided to write an ebook on the subject to help people understand and work with their emotions. 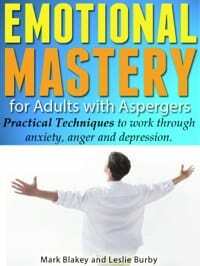 The book is called Emotional Mastery for Adults with Aspergers – Practical techniques to work through Anxiety, Anger and Depression. It can be read on devices such as pc, kindle, ipad, iphone, android or any other where the kindle software can be downloaded. I scored 42 and then 45 when I took it a second time. I am 48 now. My concern is that I suffered childhood trauma and I’ve read that it can minicomputers the signs/symptoms of aspergers. As a result I still feel unsure if I have it or not! I am currently on a waiting list for testing but the wait is approximately 14months. I scored 40 on the test. Not surprised now but i should know earlier in life that i am wired differently! It would help! Finally light on the subject! Finally seeing my social struggles and failures in the totally different perspective. I operate well if i can let be me – i am not on the collision course with anyone. Labeled as a little awkward and “no fun” girl or coworker for years i have tried to be like others….and failed. Where there is an expectation of certain behaviors – i am lost, confused and always rejected as “non belonging”. I do not belong, but i can coexist contributing what i am good at. Small talk and being socially liked is not my thing. I barely function in the corporation, but now i know why – i do not need “beat myself up”. At least i can keep job and lead productive life! It wasn’t easy. It pushed me through depression as i wanted to be like others. Parties and social gatherings were always very difficult – i participated at some and wondered how people can enjoy noise, conversations with many people at the same time, food i didn’t like or was able to eat…and often smoke, perfumes or culinary smells….. if i knew it is ok to be differently wired it would be so much easier!!! Less time lost on things that can not be solved. I felt guilty that i do not like to meet with family and friends, but i loved to be with each of them one at the time and in the quiet peaceful place or doing things together instead of just talking. I enjoyed deep conversations about hobbies or at least talking about the movie … but other things….other topics totally confusing or hard to follow – the gossips or some descriptions about troubled relationships…. At least i know that “hearing” fluorescent light and “smelling” other people emotions is not crazy, but possible and different way of processing. That not liking to be too close to people is not a sign of being bad person….. I spent 50 years trying to fit instead of learning how to find a way to create safe, less stressful place to be my best self. Trying understand why I operate differently instead of finding right “frequency” to make connections. A lot of “problems” were solved when i could have my own office, when people finally accepted that not eating their cake does not equal not liking them….. I like saying “To operate on the same wavelength” for being understood. I believe we all should shine the colors we have in all of us. Some are socially talented some know how to find patterns, some have ability to memorize what they see, but are unable to look in people’s eyes. More examples of how different people are from each other can find a way to map the similarities and accept them as a fact. I can relate. I am having difficulty keeping a job. Wondering what type of work you do? I changed careers to work with children because I can relate to them better but all the activity, screaming, fits and behavior I have to deal with offsets it. It is exhausting. I used to have a lot of friends, now I have none. I have fibromyalgia/CFS also so I am isolated and tired a lot. I took the online Aspergers test and it came back that I have symptoms of Aspergers. I was constantly bullied at school and at home, even when I went into care I was bullied and still get pushed about verbally and emotionally. I have very low self esteem and confidence and I hate loud noises. I can’t understand instructions very well and cannot concentrate on a book or film for very long. I hate social situations, including going shopping as I can’t cope with being around too many people. I also suffer from anxiety, panic attacks and depression. At the moment I am having CBT and counseling but finding it hard to do the tasks that the counsellor wants me to do. I am scared of nearly everything and constantly shaking. I don’t understand why I am this way or what and if I can do anything about it. Stephen I hope you are OK! Reading your words brought tears to my eyes you so elequently wrote what my son cannot articulate I felt you had tapped into his mind and written it for him ! You are not alone and the responsibility as far as I am concerned is on the medical profession who need to support you. Its not enough to try and live life the way you think the world expects you to unfourtunatly we aspies tend to carry more than we can bare but with the right support we can do amazing things and it sounds like you have achieved so much in this foreign world. Stay strong,be you,breath and remember you will always be a hero to your loved ones after all you have shown more strength and courage than you give yourself credit for! Only a person with aspergers can keep trudging day after day through the thick fog of life. We don’t just get up a little tired maybe grumpy get dressed and go to work everything is overwhelming and confusing yet we try and try. You are a very brave man and I for one know your struggle’s. Get help from all those who are paid to help after all that’s their job and if they ain’t helping who’s failing? Im lying aware at 4am? Ive tossed and turned as wracked with guilt and im so low, deep down, self pitying low and also so very down it worrying me. Im flunking at work, in life and in everything i feel – why is it just happening to me? I feel down, a terrible down – ive missed deadlines, clients complaining and the new boss waiting for a workload review with me. I cant face it all being loaded on me. I cant sleep and im just so tired and worried and down but this isnt right, even for me. What will i do, what will i do, what will i do ringing in my ears the little voice is shouting at me. Im just so tired, so very very tired. Went down at midnight woke not long after one. Im struggling and im so very down – deep down its even worrying me. I cant take more time from work – I’ve had enough or that might be it and the end of work for me. I just want the holidays to see my other son, do the three years outstanding tax returns and everything thats expected of me but again everything’s closing in on me. Ive been in the new job for ten months now and its not going well for me, and its the third this year for me. I have an astonishing cv,with letters, awards, papers abound but troublesome recent train wreak of career behind me. I bet they all blame me. Im dyslexic, a very high achiever but their is just so much i dont get, the hidden disability then say and my sons autistic so what about me.? Ive asked work for an aspyrgers test again and again, as i feel a failure and questioning what is wrong with me. Im stressed and so pressured and having had so much time off – im now asking for an exit strategy so i can recover me. I dont have many friends and it feels the world is against me. I just dint get why things dont work out for me and people are as mean as can be. I dont know whats wrong with me – doctors and coucellor and a weird thing i didnt get called CBT? Nothing has worked for me. Anti depressants or time off work neither or either have worked for me. Im just so unsettled at work can it just be me. Is it simply the failure in me. I have no joy in life and its not just affecting me – my poor partner how she has suffered terribly for me. She try’s to understand me and was the first to suggest and online aspyrgers tested to me – thinking strongly its was aspyrgers affecting me. My poor poor kids what will they think of me. A hero they call me, daddy and hero they call me but are they becoming lost to me. What will aspyrgers do to me. Last night it was the stress of another unproductive couple of days – god i cant face work Again to day, i want to run away and be me. Im so wrapped up in myself and again blew up at the slightest thing – the smell of the cleaning agent was so over powering to me. My poor partner and children who suffer such with me. Im just so down im on my knees, i speak out but no one listens to me. Why are brief periods of joy are now meaningless to me. Why has my joy and hope departed me, i dint know whats happening to me. Im bright and smart and people look up to me – but this again this pressures me. Im dyslexic and proud to be, but what are my feelings doing to me. Im down, deep disspairing down. Ive tested positive for aspyrgers online. A word i can hardly spell and what this means is confounding me. I dont know how in feel about the word aspyrgers defining me or what this means to me. What happened to the nuro-normal in me? Just read this article and people are having wee words with me. Im expecting and dreading the stronger words facing me. I have little left and just want to curl up and be me. Im crying now as i dont know whats wrong with me. The HR girl was frowning and critical of me – my fault theve lost sight of the adjustments for me, my fault ive not had the doctor test me. The extra burdens all put on me. I can cope with dyslexcia but what does aspyrgers mean for me. Is it the scrap heap for me? Is it the end of me – am i a fool and a sham or its it worse for me. Ive been through his before and know what the deep down means for me. This article and the other has given a little new perspective to me and what more on what aspyrgers and depression means for me. Life full of choices and again despite being down, its time to again find whats right for me and explore whatever that may mean for me. My life may be a disaster to me but its my life and its very much up to me. So a little more time for me to be me and then to face the day which might just be a day to excel for me. A day to wash the deep down again from me. To find the little thing to give back joy to me. To let the little aspy in me be free to be me. Steve, I feel it too. Here’s something that’s really, really helped. it’s a special “shake” designed to help change your body chemistry from acidic to alkaline. originally to help people lose weight. As a depressed aspie – I found it did something even more wonderful. You need powedered wheat grass, powdered spirulina, and cocoa powder. Take one teaspoon of each and make a shake. You can add it to ice, milk, bananas, strawberries, mangos, blueberries, etc. Works very well in a blender. But, 3 teaspoons of the powders above (1 table spoon equivalent) in a drink of your choosing. Now, this thing is going to be dark green, and may smell of grass or something. However, drinking one 8 ounce glass of this for/with breakfast is all you need to do. This drink will curb your appetite, but after a few days drinking it (3-5 for me) the trace minerals and vitamins will build up in you and all of a sudden you get this sense of well being that was absolutely life changing. When I’ve been “off” my shake I’ve found I can go 3 maybe 4 days before the effects wear off. Much easier to just keep drinking it. I tell you, I’ve been depressed all my life, when this stuff hit me and I realized one day at work how I felt I almost fell out of my chair. Now, I have friends who take this too – they’re neuro normal, but they’ve seen nice steady weight loss because it curbs your appetite. The thing is there’s lots of B6/B12 in the spirulina, and the cocoa is a mood booster. You can google the effects of these natural products. you can buy these in most health food stores or on line. I’m not selling anything – just passing on what has been a life changing dietary supplement for me. My wife has taken super foods for several years and she did not notice a difference, however, my 16 yr old daughter has had it (neuro-normal) and she definitely notices the overall sense of well being you get from this drink. Wakes you up, gives you a positive mental attitude, and that gives you energy to make something happen. It won’t take away the other issues we face as aspies. But, it changed my mental outlook in such a way that I’ve been able to cease focussing on the seriously negative and have hope which lets me look at the more positive. One of the posts in these Aspergers threads said the easiest cure for depression is: exercise and more B6/B12. So, with the drink you get the vitamins and mood boosting cocoa – that may power you for some weights or cardio which could help with the depression – at least a way to work off some tension. A better life is waiting out there for you, and for you with your loved ones, and for you and your co-workers. I feel for you; I’ve written similar poems and prayers myself at times. Please don’t give up. As I’ve now recognized I’m an aspie (53 yrs old) it not only explains who I am and how I lived my life and how/why I was treated the way I was, and why I’ve acted the way I have it’s also empowered me – I don’t ever want to be healed of this. We’ve got super-powers the rest of humanity can only dream of. We see patterns, make connections of disparate data, see things clearly, experience emotions more powerfully, recognize smells and textures other people don’t even notice. It’s like reading about comic book super heros. And the effects are so broad – language, art, music, science, fantastically deep hobbies. People like us are what make some of the boring and tedious parts of science possible – who else would study one species of bird on one island for 30 yrs and write about it? A neuro-normal? never. And now, I’ve got a new hobby to learn about – myself and Aspergers. Why? to know how I work which will enable me to know how I fit. My wife has been learning with me; the “ohhhh, now I get it…” moments for her are very rewarding. We’re connecting on stuff we never knew before and learning why I am the way I am is helping her process our life together. It brings grace because people learn it’s not on purpose for us – it’s just the way we are. Your kids think you’re a hero – that’s awesome. They need you, and so does the world. Try the drink. 5 days (a guess – we’re all different no telling how your chemistry will work with it). Hello I am a 50 yr old man who has only been recently confirmed as a person whom has aspergers or is autistic .It actually explains a hell of a lot why I was so badly bullied by my father and my sisters and so called school friends and even Christian fellowship in Sydney . I always thought there was a problem lack of social clues and often saying the same thing difficulty in relating and scaring girls and being avoided by them .I have had trouble with very loud doof doof music it makes me very ill because of also having a tumour in my left ear on the auditory nerve . I am hyper sensitive to the feelings of others. My problem is that I have no idea how to respond appropriately to them. Please write a book that tells me that. Since losing my permanent job of 25 years nearly 2 years ago, dealing with anger seems to be my full time job these days. I feel that without a regular permanent job, I will never feel like the same happy person again, and that is what really scares me. I am getting therapy for my problems. I am only 58 years old. How can I get Emotional Mastery for Adults with Aspergers for by Kobo reader?